Cover your recycled trees in felt, paper, gift wrap or fabric scraps! My family goes through an abundance of cereal as well as other boxed items like mac and cheese, gummy snacks and pop tarts each week. This leaves at least a few of those thin cardboard boxes lying around to be recycled on trash collection day. 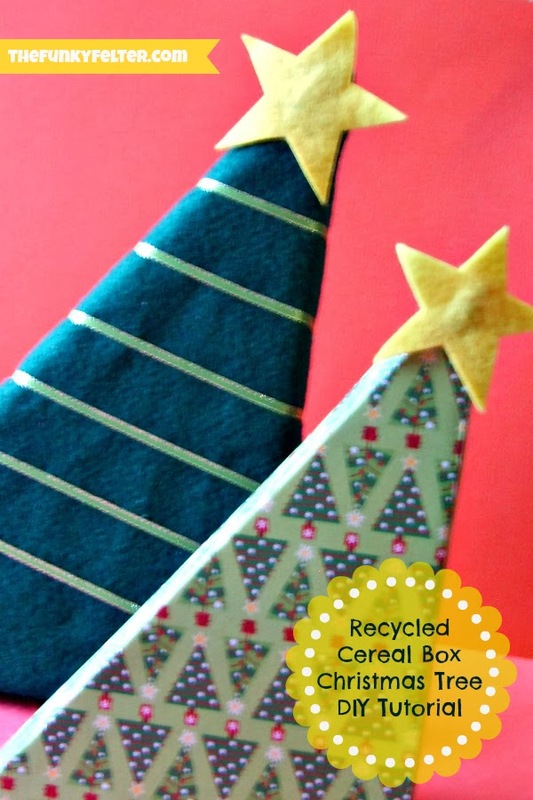 I decided to experiment with a couple of the larger sized cereal boxes and came up with these quirky leaning Christmas tree decorations. 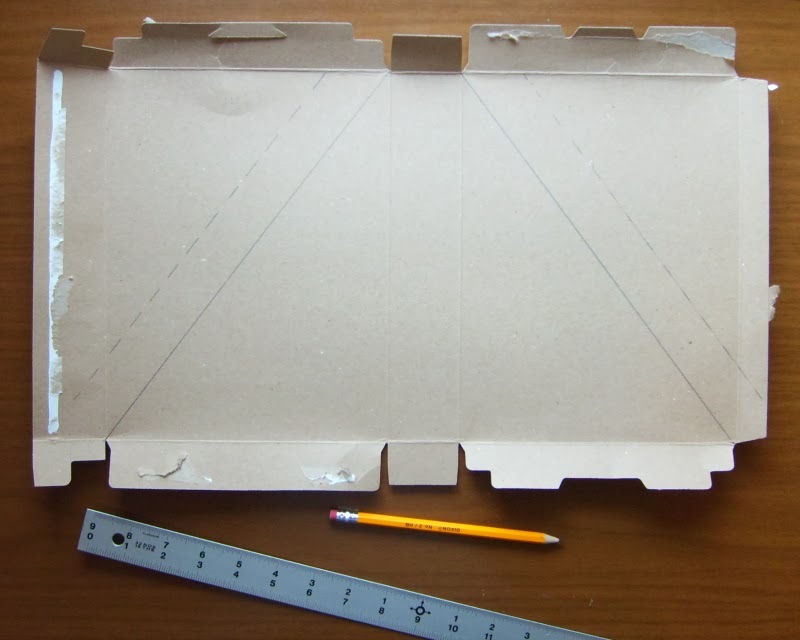 For this DIY project you can really use any thin cardboard box to make a tree so pick and choose what size you want from your own recycleables. CRAFTY TIPS: If kids will be helping you, I recommend swapping out the hot glue gun for some fast drying tacky glue or using a low temperature glue gun instead and supervise well. 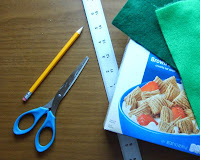 For the embellishments, you can purchase sticky back felt or foam shapes at craft stores for easy decorating with kids. Cut on the outer dotted lines forming a triangular shape from the opened box. 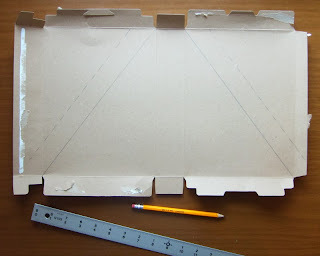 Then fold over to crease the inner lines forming flaps on each diagonal side. At this point, I turned the triangular cutout over so that the cereal box graphics would be on the inside, but you don't have to. 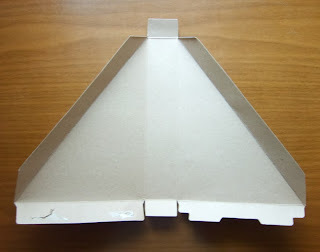 Using the existing side spine of the box, fold the triangular side sections inward. 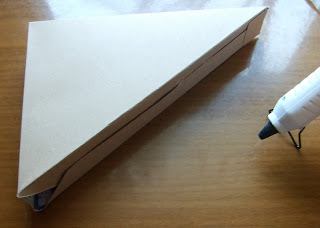 Then overlap the end flaps about 1/2 inch (or so that it is about the same width as the box spine) and glue in place. Also overlap the existing bottom flaps and glue in place. Trim any odd pieces as you go and lastly glue the top existing flap over (if there is one). 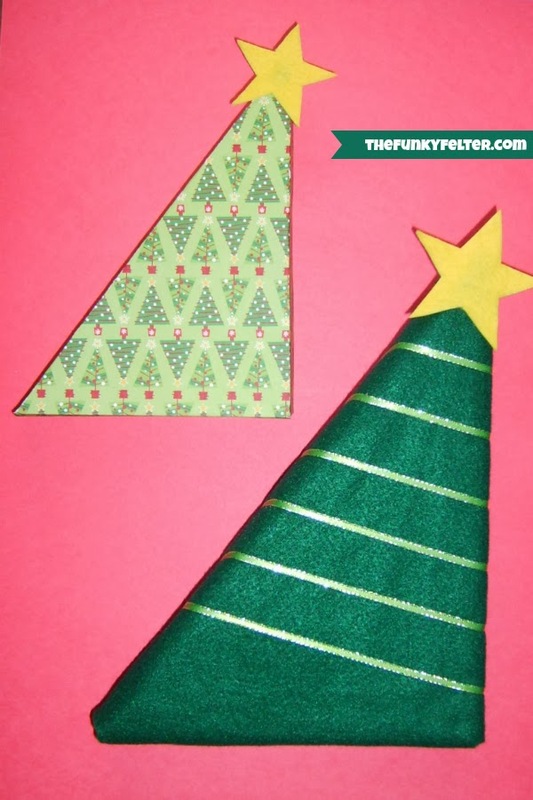 You should end up with a slanted hollow triangle shape for your Christmas tree. That sideways slant is why I call this a quirky little tree, but that's part of the charm! Now that you have your quirky tree shape, it is time to cover it. (I used a few craft felt sheets to cover this tree, but you could also use scrapbook papers, gift wrap or even fabric scraps.) 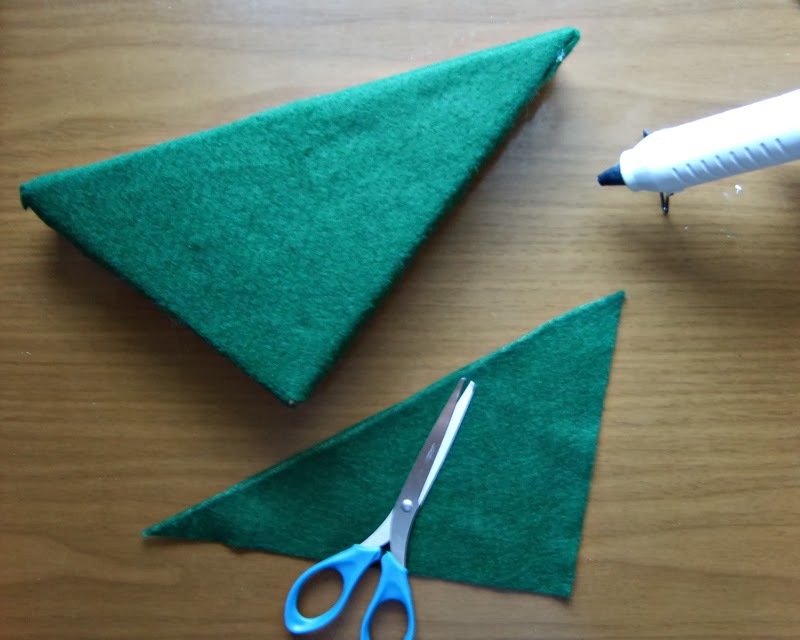 Lay the tree shape on the felt sheet leaving about an inch of space all around. 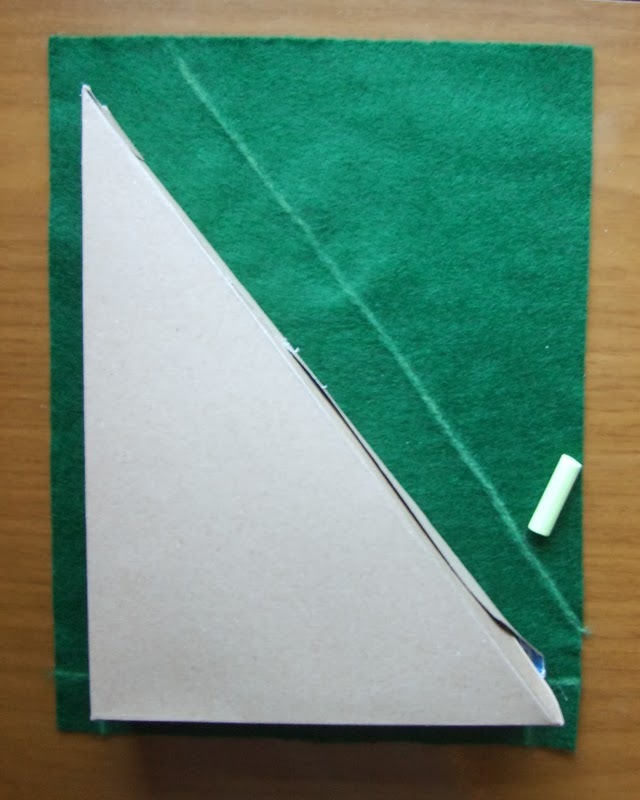 For felt, use a piece of chalk to trace about 1-1/2 inches from the slanted edge. Also trace little square cutouts at the bottom corners. Then cut out the felt covering for that side. Flip the tree shape over and trace another piece of felt as before to cover the other side. Using the hot glue gun, adhere the felt cutouts to each side overlapping on the sides as you fit it onto the tree shape. Trim any excess bits as needed. And, if you don't quite cover the sides where it overlaps, cut some strips to fill in where needed. Once you've covered your quirky tree, it is time to decorate! For the star, I used yellow felt tracing a star cookie cutter shape onto it. Then I cut it out and glued it to the top of my tree. You could use a premade star or something entirely different to top your tree. Wrap ribbon around it as a garland or embellish with sticky back felt cutouts or other fun stickers. Make it your own and dress it up however you like! These are really cute and kid friendly!